From summer 2018 available Air c just for June,July and August. CasaMontepulciano is situated in the heart of the old town center of Montepulciano, just across the picturesque walls of Palazzo Contucci(a magnificent ancient wine cellar), which rise majestically from via Cagnano to Piazza Grande. Here you can admire the most impressive palaces of Montepulciano, designed by famous architects of the Renaissance such as Sangallo, Michelozzo and the like. CasaMontepulciano is very close to the main avenue. Piazza Grande is roughly 100 m (328 ft) away, and all the main attractions of town are in walking distance, so are the shops, bars/coffee shops and restaurants. Luca, the owner, will greet you at your arrival. You are welcome to tap into Luca's vast and skilled experience in food and wine, his true passion, to find the best restaurants and the most prestigious wineries,wines and wine bars in the area. We are pleased to inform our guests that upon their request we can organize wine tastings on their premises. During these one hour long sessions, sommelier Silvia Goglio will explore Tuscany's vast enological tradition. Coordinates of the apartment are . For those who don’t own a gps navigator or for anybody prefers this option, we can plain and I’ll wait for you in one of the places listing below.Form there I’ll lead you with my car in front of the apartment. After having unloaded luggages I’ll lead you to the nearest parking area and then bring you back to the apartment again. How to reach it: All straight till the northern base of the town where you’ll find on the left S.Agnese Church and in front of it a big square. How to reach it: All straight till the intersection at the southern base of the town then go straight again on a street with big cypresses for about 200 mt. The apartment was very comfortable and lovely and in a terrific location. We stayed a week in November 2019. It was great to come home to the apartment after a fun, long day of sight seeing. Luca, the owner, was unable to meet with us, but his girlfriend met us and took us to the apartment and give us the information we needed. And Luca was available by phone for any questions we had. He also provided us with a resident parking pass so we could park our rental car. Most days we were able to park right in front of the building. And it was terrific to have a washing machine to do laundry! We hope to stay here again. Everything was great! Many thanks, Luca!! Loved the location and very convenient if traveling by car. Luca was a great host. Would recommend. Luca was so helpful and friendly - he made it easy to meet up and get to the apartment and made a great recommendation to a wine bar that was perfect for dinner. 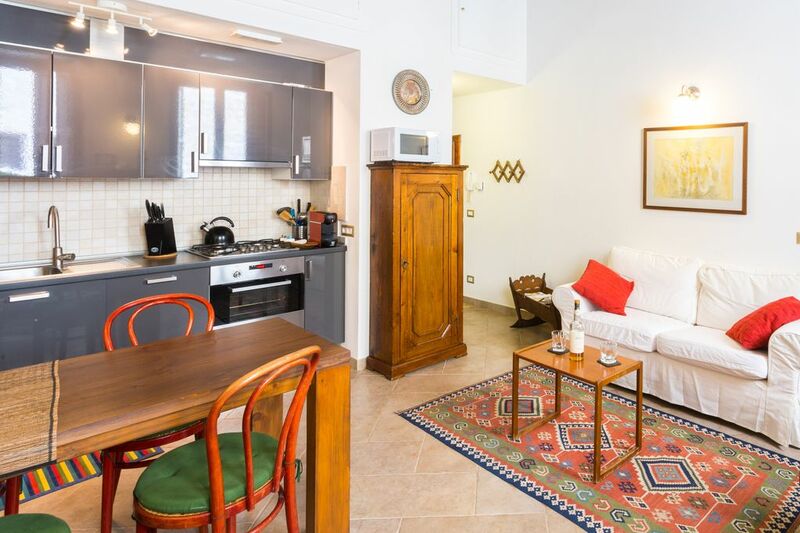 This apartment is in an amazing location, right in the middle of the old town of Montepulciano. You can walk to everything - restaurants, cafes, the duomo and piazza - and the views into the surrounding countryside are incredible. The apartment is clean, bright, comfortable, well-stocked - truly a perfect place to spend a few days. We were so happy and would be delighted to return. Thank you, Luca! Convenient. Everything worked. Great location to restaurants and shops. Rustic apartment near the centre of the old town. Luca gave us some great tips on restaurants and shops. Very clean. Nespresso coffee maker was so appreciated by us. If you are looking for a place in the heart of Montepulciano, this is your place. It is just off the Main Street and an easy walk to anyplace in the core of town. The trade off is that it's a bit of a walk or short drive to get outside the walled city. Luca has all of your basic needs in the kitchen and bath. It's 2 bedrooms with 3 separate beds - a must that is hard to find for us. Luca also has wines available in the apartment for sale. He gave us a brief run down on the wines in the region, which was educational. One plus - they have an air conditioner! It doesn't quite reach all of the bedrooms but helps much more than if there wasn't one! Luca's 2 bedroom apartment was exactly what we were looking for during our week long stay in Montepulciano. if you leave the apt. and go to the left you are a 3 minute walk uphill to the Grand Palazzo; turn to the right and in 30 seconds you are on the Main St where there are many many shopping and dining locales. When...not if we return to Montepulciano we will rent from Luca again.